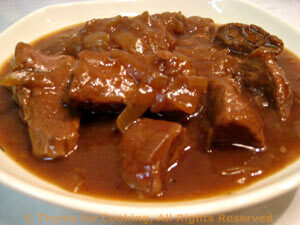 Thyme for Cooking Menus: Beef Braised in Beer, easy recipes. You can use Guinness for the beef, although this recipe is not a proper 'Beef in Gui ness', but any beer will do, although dark will be more flavorful. You should be able to buy single cans or bottles. Mashed potatoes with cabbage, bacon and butter... In poorer times this would have been a meal, rather than a side dish. We'll have it as a side dish for 2 meals; first mashed, then fried. 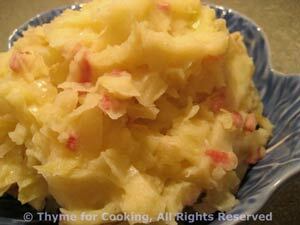 Peel the potatoes and cut in large chunks. Cook in boiling, salted water until tender. Shred cabbage by cutting slice off of head, lay the slice cut side down and cut into 4ths, then, cutting across, slice 1/8 inch thick. Do not use the core of the cabbage - you'll recognize it when you see it. One 'side' of the cabbage will probably be enough for the 2 cups. Save the rest for later. When the bacon is crisp, remove and crumble. Add the onions to the pan and sauté briefly, scraping up in brown bits from the bacon. Add the cabbage and stir well. Add the chicken stock, cover, reduce heat and cook until cabbage is tender, 10 - 15 minutes. When the potatoes are done drain and mash. Add the butter and milk. Mash together. Consistency should be of soft mashed potatoes. Add more milk if needed. Stir in the bacon and cabbage. Mix well and serve. When the potatoes are done drain and mash. Add the butter and milk. Mash together. Consistency should be of soft mashed potatoes. Add more milk if needed. Stir in the bacon and cabbage. Mix well and serve.